The pressure gage is one of the service person’s most valuable tool. Thus, the quality of the work depends on the accuracy of the gages used. Most are precision-made instruments that will give many years of dependable service if properly treated. The test gage set should be used primarily to check pressures at the low and high side of the compressor. The ammonia gage should be used with a steel Bourdon tube tip and socket to prevent damage. Once you become familiar with the construction of your gages, you will be able to handle them more efficiently. Drawn brass is usually used for case material. It does not corrode. However, some gages now use high-impact plastics. A copper alloy Bourdon tube with a brass tip and socket is used for most refrigerants. Stainless steel is used for ammonia. Engineers have found that moving parts involved in rolling contact will last longer if made of unlike metals. That is why many top-grade refrigeration gages have bronze-bushed movements with a stainless steel pinion and arbor. The socket is the only support for the entire gage. It extends beyond the case. The extension is long enough to provide a wrench flat enough for use in attaching the gage to the pressure source. Never twist the case when threading the gage into the outlet. This could cause misalignment or permanent damage to the mechanism. NOTE: Keep gages and thermometers separate from other tools in your service kit. They can be knocked out of alignment by a jolt from a heavy tool. Most pressure gages for refrigeration testing have a small orifice restriction screw. The screw is placed in the pressure inlet hole of the socket. It reduces the effects of pulsations without throwing off pressure readings. If the orifice becomes clogged, the screw can be easily removed for cleaning. Most gages retain a good degree of accuracy in spite of daily usage and constant handling. Since they are precision instruments, however, you should set up a regular program for checking them. If you have a regular program, you can be sure that you are working with accurate instruments. Gages will develop reading errors if they are dropped or subjected to excessive pulsation, vibration, or a violent surge of overpressure. You can restore a gage to accuracy by adjusting the recalibration screw (see figure below). If the gage does not have a recalibration screw, remove the ring and glass. Connect the gage you are testing and a gage of known accuracy to the same pressure source. Compare readings at mid-scale. If the gage under test is not reading the same as the test gage, remove the pointer and reset. This type of adjustments on the pointer acts merely as a pointer setting device. It does not reestablish the original even increment (linearity) of pointer travel. This becomes more apparent as the correction requirement becomes greater. 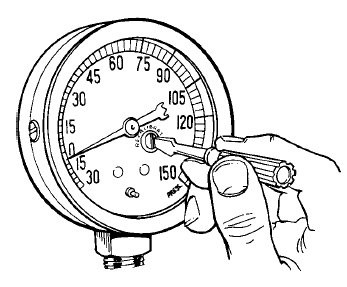 If your gage has a recalibrator screw on the face of the dial as in figure, remove the ring and glass. Relieve all pressure to the gage. Turn the recalibration screw until the pointer rests at zero. The gage will be as accurate as when it left the factory if it has a screw recalibration adjustment. Resetting the dial to zero restores accuracy throughout the entire range of dial readings. If you cannot calibrate the gage by either of these methods, take it to a qualified specialist for repair. The function of the boiler furnace is to convert into heat all the latent chemical energy of the fuel. External heat is applied to the fuel to cause its ignition initially; subsequently the heat is generally supplied by the furnace walls and, in the case of coal, from the bed of glowing fuel. While combustion is taking place, if the temperature of the elements is lowered, by whatever means, below that of ignition, combustion will become imperfect or cease. Gases developed in a furnace passing too quickly among the tubes of a boiler may be similarly chilled and thus combustion be stopped, causing a waste of fuel and production of large deposits of soot. Part of the heat developed in the furnace goes from the fuel bed or flame directly into the metal of the tubes by radiation. The rest of the heat raises the temperature of the gases resulting from the combustion—carbon dioxide, nitrogen and water. These gases pass among the tubes transmitting their heat through the tube walls to the water and steam. Thus the gases are cooled and, since they cannot leave the boiler at a lower temperature than that of the water and steam in the tubes, the amount of heat which can be released by the gases is directly dependent on the temperature of the gases when they enter among the tubes. It is important, therefore, that the gases be raised to as high a temperature as possible in the furnace. Hence, every factor affecting this temperature should be considered carefully. 1. Excess air is required to achieve complete combustion of the fuel, but as more excess air is supplied, the temperature tends to decrease; if the amount of excess air is decreased to too low a point, the amount of heat liberated will be decreased since incomplete combustion results. 2. So much heat can be generated even with the lowest possible excess air that the temperatures reached may breakdown the enclosing refractory brick of the furnace. The absorption of heat by the enclosing brick together with a large area of water-cooled surface exposed to the heat, may lower the temperature of the furnace and result in poor efficiency. 3. Since the quantity of heat radiated from a burning fuel is dependent upon the duration as well as the temperature, the temperature of the fire will increase as the rate of combustion increases (the relation of fuel to air remaining constant). Rates of combustion of fuel must be matched by appropriate amounts of excess air so as not to produce excessively high temperatures that may cause rapid deterioration of the refractory brick of the furnace. To protect the brickwork, temperatures are held down by water screens surrounding the furnace, or by water circulated in piping behind or within the brickwork. This permits higher temperatures of combustion to exist with greater heat absorption by the boiler heating surfaces (carrying the water to be turned into steam) both by radiation and by convection from the hotter gases emanating from the fire. The result is greater boiler efficiency. The furnace portion of the boiler and its cubical volume include that portion between the heat sources (grates for coal, jets for pulverized coal, oil and gas) and the fi rst place of entry into or between the first bank of boiler tubes. 4. Method of air admission. Anthracite coal needs no special provision for a combustion volume until the boiler is forced to high ratings. The fixed carbon, which comprises a large percentage of the coal, is burned near or on the grate. The carbon monoxide gas rising from the fuel bed requires some combustion space to mix with the air thoroughly, but not much volume in comparison with the highly volatile ingredients found in oil and gas. Bituminous coal is high in volatile content and requires considerable furnace volume because a large portion of the volatile combustibles must be burned above the fuel bed. In burning high volatile coal, the distillation of the volatile matter takes place at a comparatively low temperature. This condition is favorable to the light hydrocarbons which are more readily oxidized than the heavier compounds which distill off at higher temperatures. Slow and gradual heating of the coal is necessary to bring about the desired results. Once the volatile matter starts distilling off, it must be completely oxidized by the proper amount of air in order to approach smokeless combustion. In burning pulverized coal, oil or gaseous substances, the important factors are the volume of fuel to be burned, the length of the flame travel, and turbulence. In general, the greater the percentage of volatile matter present in fuel, the larger must be the combustion space but these two factors are not directly proportional. When a boiler is operating at a low rating, the fuel and air have quite a period in which to mix and burn completely. As the rating is increased, both the fuel and air are increased. A proportion of the uniting of oxygen and carbon monoxide takes place in the furnace chamber. If the boiler rating is increased to such an extent that the mixing has too short a duration in the furnace volume, the gases will enter the tube area and ignite, producing what is known as secondary combustion, unless they have been cooled below ignition temperatures by the ex- change to the tubes. The higher rating expected from a boiler, therefore, the larger should be the combustion space. To produce effi cient combustion each certain grade of fuel requires a defi nite amount of air to unite with a pound of the fuel. The amount of air varies according to the ingredients of the fuel. The fur- nace volume must be such that the air required has sufficient time to unite with the fuel as well as to take care of the expanded gas at the furnace temperature. The method of air admission is dependent upon the air required which, in turn, depends upon the kind of fuel. The furnace volume for pulverized coal, oil or gas is large in comparison with a stoker installation not only to admit additional air properly but to provide for the long flames. The different ducts required for air admission necessarily have an effect on the shape of the furnace volume. In many respects, the four stroke cycle gasoline engine and the four stroke cycle diesel engine are very similar. They both follow an operating cycle consisting of intake, compression, power, and exhaust strokes. They also share the same system for intake and exhaust valves. (1) In a diesel engine the fuel and air mixture is ignited by the heat generated by the compression stroke, versus the use of a spark ignition system in a gasoline engine. The diesel engine therefore needs no ignition system. For this reason, the gasoline engine is referred to as a spark ignition engine and a diesel engine is referred to as a compression ignition engine. (2) In a diesel engine the fuel and air mixture is compressed to about onetwentieth of its original volume. In contrast, the fuel and air mixture in a gasoline engine is compressed to about one eighth of its original volume. The diesel engine must compress the mixture this tightly to generate enough heat to ignite the fuel and air mixture. (3) The gasoline engine mixes the fuel and air before it reaches the combustion chamber. A diesel engine takes in only air through the intake port. Fuel is put into the combustion chamber directly through an injection system. The air and fuel then mix in the combustion chamber. (4) The engine speed and the power output of a diesel engine are controlled by amount of air is constant. This contrasts with the gasoline engine where the speed and power output are regulated by limiting the air entering the engine. (1) The diesel engine is much more efficient than a gasoline engine due to the much tighter compression of the fuel and air mixture. The diesel engine produces tremendous lowspeed power, and gets much greater fuel mileage than its gasoline counterpart. This makes the engine very suitable for large trucks. (2) The diesel engine requires no ignition tuneups because there is no ignition system. (3) Because diesel fuel is of an oily consistency and is less volatile than gasoline, it is not as likely to explode in a collision. (1) The diesel engine must be made very heavy to have enough strength to withstand the tighter compression of the fuel and air mixture. (2) The diesel engine is very noisy. (3) Diesel fuel creates a large amount of fumes. (4) Because diesel fuel is not very volatile, cold weather starting is difficult. (5) A diesel engine operates well only in lowspeed ranges in relation to gasoline engines. This creates problems when using them in passenger cars, which require a wide speed range. e. Usage. Diesel engines are widely used in all types of heavy trucks, trains, and boats. In recent years, more attention has been focused on using diesels in passenger cars. f. Multifuel Engine. The multifuel engine is basically a four stroke cycle diesel engine with the capability of operating on a wide variety of fuel oils without adjustment or modification. The fuel injection system is equipped with a device called a fuel density compensator. Its job is to vary the amount of fuel, keeping the power output constant regardless of the fuel being used. The multifuel engine uses a spherical combustion chamber to aid in thorough mixing, complete combustion, and minimized knocks. Psychrometrics is the science of the properties of moist air, i.e., air mixed with water vapor. This subset of thermodynamics is important to the HVAC industry since air is the primary environment for all HVAC work. Whereas oxygen, nitrogen, and other components of dry air behave similarly in only a vapor phase in the HVAC temperature range, water will undergo a change of state in the same temperature range based on pressure, or in the same pressure range based on temperature. In the human comfort temperature range, the comfort of people and the quality of the environment for health, for structures, and for preservation of materials are also related to the moisture in the air. Control of the moist-air condition is a primary objective of the HVAC system. Air is considered to be saturated with moisture when the evaporation of water into the air at a given temperature and atmospheric pressure is offset by a concurrent condensation of water vapor to liquid. Cooling of saturated air results in dew, fog, rain, or snow. Warm air can hold more moisture than cold air. Percent relative humidity measures how much water vapor is in the air compared to how much there would be if the air were saturated at the same temperature. The adjective relative is appropriate because the absolute amount of water that air can hold is relative to both temperature and barometric pressure. Changes in barometric pressure related to altitude or to weather conditions affect the moisture-holding capacity of air. A psychrometric chart which presents properties of mixtures of moist air on a single graph is a most useful tool for quantitatively calculating and analyzing HVAC processes. Familiarity and facility with these charts are a must for the HVAC designer. It is impossible to remove moisture from air in a heat exchangecooling process without bringing the air near to the saturation line. Moisture may be removed by desiccants without approaching saturation. Moist air in cold climates is a problem and a liability for building designers. Since the inside environment usually is moister than the outside air, insulation and vapor barriers are required to prevent condensation in the structural cavities. Failure to respect this liability may lead to early deterioration of a building. Swimming pools and humidified buildings (hospitals, etc.) are particularly vulnerable. include shortage of breath and coughing. These systemic and respiratory symptoms occur with initial exposure; i.e., the first day of the work week. They progressively improve during exposure and in the absence of exposure, only to recur on re-exposure. In a work setting, symptoms appear on Monday, improve during the week and weekend and recur the following Monday. This pattern clearly distinguishes humidifier fever from hypersensitivity pneumonitis. During the height of the reaction, medical examinations reveal the presence of late inspiratory crackles during auscultation (“listening” to the chest) and impaired gas transfer in the lungs. The chest radiograph is always normal and the lung function is normal between attacks.The cause or causes of humidifier fever are not known. Some organisms have been isolated and incriminated during outbreaks, but as yet not indisputably identified. However, immunological investigations almost always reveal the presence of precipitating antibodies to antigens extracted from the humidifiers. In bronchial provocation tests, water from the humidifier usually reproduces the symptoms and physiological changes. Attack rates vary considerably in reported outbreaks. Age appears to be a factor and appears to be associated with the duration of exposure and the development of antibodies. Highest incidence rate is in the winter (probably due to seasonal humidifying activity). Subsequent early study by Finnegan and others has shown that SBS is not limited to air conditioned facilities and can, in fact, be observed in naturally ventilated buildings. More recent joint research in England by British architect Alexi Marmot and her husband Michael, an epidemiology professor, concludes complex SBS involvement with the occupant’s home environment, poor facility management, and worker satisfaction. A syndrome, by definition, is a group of signs and symptoms that occur together and characterize a particular abnormality. Frequently they form an identifiable pattern. This makes diagnosis by exclusion possible. For example, organic lesions are not associated with SBS. If an occupant has persistent organic lesions, it can be assumed that the cause of the sickness is not SBS. A building is said to be “sick,” when 20 percent or more of the occupants voluntarily complain of discomfort symptoms for periods exceeding two weeks, and affected occupants obtain rapid relief away from the building. The 20 percent figure is an arbitrary level derived from earlier ASHRAE efforts to define comfort. This acceptability level, when transferred to the IAQ arena as a level of temperature acceptability, may mislead managers who look to “20 percent” as a guideline for action. A knowledgeable investigator would ask, “If you have 3,000 employees and only 10 percent are ill, do you wait? That’s 300 people who could be suffering needlessly from a pollutant in the work place.” A problem closely associated to SBS is building related illness (BRI). Medical diagnosis can identify specific health effects that result in known disease etiology, such as Legionnaire’s disease, that are a direct result of building conditions. Once diagnosed, a BRI can help identify the source contaminants and may reveal ways to remedy the situation. A BRI facility has almost always passed through the SBS stage and usually still has other contributing contaminants or causes at work. The five symptom complexes associated with SBS are discussed below; followed by the major building related illnesses. People, lights, motors, heating equipment and outdoor air are examples of substances that give off sensible heat. A seated person in an office, for instance, gives off approximately 225 Btuh of sensible heat into the conditioned space. Enthalpy units of sensible heat are in Btu/lb°F. The change in the sensible heat level as measured with an ordinary thermometer is sensible temperature. Sensible temperature is measured in degrees Fahrenheit (°F) and it is indicated as dry bulb (db) temperature. Sensible temperatures are written °Fdb. For example, 55°Fdb. The definition of latent or hidden heat is: heat that is known to be added to or removed from a substance but no temperature change is recorded.” The heat released by boiling water is an example of latent heat. Once water is brought to the boiling point, adding more heat only makes it boil faster; it does not raise the temperature of the water. The level of latent heat is measured in degrees Fahrenheit (°F) and it is indicated as dew point (dp) temperature (for example, 60°Fdp). Enthalpy is in Btu/lb°F. People, water equipment, and outdoor air are examples of substances that give off latent heat. A seated person in an office gives off approximately 225 Btuh of latent heat into the conditioned space. Total heat is the sum of sensible heat and latent heat. It is measured in degrees Fahrenheit (°F) and it is indicated as wet bulb (wb) temperature. For example, 54°Fwb. Total heat level is measured with an ordinary thermometer; however, the thermometer tip is covered with a sock made from a water-absorbing material. For room wet bulb temperature the wet bulb thermometer is typically in an instrument such as a sling- or power-psychrometer along with a dry bulb thermometer. Enthalpy is in Btu/lb°F. A seated person gives off approximately 450 Btuh of total heat (225 Btuh sensible heat plus 225 Btuh latent heat). A British thermal unit (Btu) is used to describe the quantity of heat contained in a given substance. Because the Fahrenheit scale is the standard system of temperature measurement used in the United States, a Btu is defined as the amount of heat required to raise the temperature of 1 pound (lb) of water 1 degree Fahrenheit (°F). A Btu is a unit of heat energy. The rate of heat consumption, called power, can be determined with a unit of heat energy and a unit of time. For example, Btu per minute or Btu per hour, written: Btu/m or Btum and Btu/hr or Btuh are common units of power used in HVAC work. Btu/hr is a unit of heat power. 1000 Btuh (can be expressed as MBh). 1,000,000 Btuh (can be expressed as MMBh). Watt-hours (Wh) or kilowatt-hours (kWh,) are units of electrical energy. A kilowatt-hour is equivalent to 1000 Watt-hours. Watts (W) and kilowatts (kW) are units of electrical power. A kilowatt is equivalent to 1000 Watts (kilo (k) = 1000). POWER EQUALS ENERGY TIMES TIME, P = E × t.
Btu/hr (a unit of power) = Btu (a unit of energy) × hr (a unit of time). kW (a unit of power) = kWh (a unit of energy) × hr (a unit of time). Mathematically, kWh is also expressed kW/hr. The heat content of a substance is called enthalpy. The symbol is h. The units of enthalpy are Btu/lb or Btu/l °F. Specific heat (Fahrenheit scale) is the amount of heat necessary to raise the temperature of 1 lb of a substance 1°F. Every substance has a different specific heat. Some examples of specific heat values for HVAC substances are: The specific heat of water is 1.0 Btu/lb°F. The specific heat of air is 0.24 Btu/lb°F and the specific heat of steam or ice is approximately 0.5 Btu/lb°F.